The topic of “faith healers” is growing around the world. Today we will look at what God actually did in the early church and highlight the problems with this fraudulent, self-aggrandizing faith healing “ministry”. We, the American Evangelical complex, exported this form of evangelism to places in Africa and South America where so-called faith healers rake in money. There is rampant fraud, false teaching, and false signs & wonders. To dig into each false ministry would consume all of our time here and would ultimately end in despair for the state of the church. Instead of doing that, let’s look to the Scriptures to see what is of the Spirit of Truth and what is of error. I’ve said this a few times before, but I am not a cessationist. The question here isn’t whether or not God performs miracles today, it is whether or not He does them at the command of self-proclaimed “anointed ones” who mishandle God’s Word when they preach and can never seem to produce evidence of their claims of miraculous healing. When God performs a miracle, a sign, or a wonder, it is to glorify Him (Soli Deo Gloria). It was no different in the early church. The signs and wonders that accompanied the Apostles were to give authority to the Gospel they preached, and that Gospel was Jesus Christ. They did not preach themselves, they did not preach for selfish gain, they did not seek the approval of men. In fact, they were persecuted, beaten, and killed for the sake of Jesus Christ. I have absolutely no doubt that we serve a Living God who is the same God who created everything out of nothing and is able to heal. I’ve witnessed Him heal my Father of cancer and my little sister’s failing kidney. These miracles were unquestionably the work of God the Holy Spirit, and we give all Glory and Honor and Praise to God. No faith-healer was involved, none was needed. In the book of Acts, Luke begins by recording Jesus’ final statements before ascending into Heaven. In them, Jesus promised they would receive the Gift of God the Holy Spirit. In Acts 2 we see that promise fulfilled and we see the resulting miracle of tongues and the boldness of Peter to preach to all who had gathered to witness the miracle of hearing the wonders of God being proclaimed in each of their native languages, and many heard the call of the Gospel, to repent and be baptized in the Name of Jesus Christ for the forgiveness of sins and the gift of the Holy Spirit. And many were added to the church on that day. Now, we will pick up at the start of chapter 3. 1 Now Peter and John were going up to the temple at the hour of prayer, the ninth hour. 2 And a man lame from birth was being carried, whom they laid daily at the gate of the temple that is called the Beautiful Gate to ask alms of those entering the temple. 3 Seeing Peter and John about to go into the temple, he asked to receive alms. 4 And Peter directed his gaze at him, as did John, and said, “Look at us.” 5 And he fixed his attention on them, expecting to receive something from them. 6 But Peter said, “I have no silver and gold, but what I do have I give to you. In the name of Jesus Christ of Nazareth, rise up and walk!” 7 And he took him by the right hand and raised him up, and immediately his feet and ankles were made strong. 8 And leaping up he stood and began to walk, and entered the temple with them, walking and leaping and praising God. 9 And all the people saw him walking and praising God, 10 and recognized him as the one who sat at the Beautiful Gate of the temple, asking for alms. And they were filled with wonder and amazement at what had happened to him.11 While he clung to Peter and John, all the people, utterly astounded, ran together to them in the portico called Solomon’s. Praise God. As you can see from the highlighting, this was no secret or private event. The Temple was the center of Jewish life, and this lame beggar was carried to the Beautiful Gate daily. The people knew who he was. 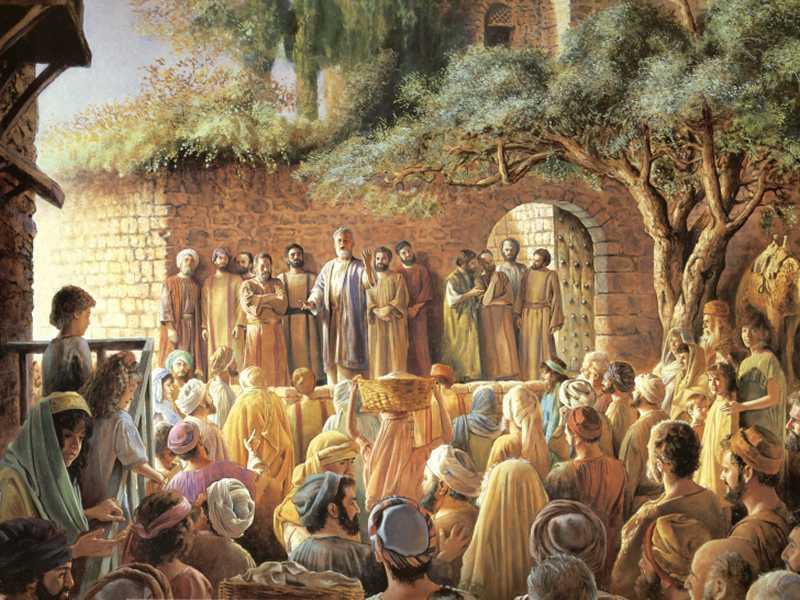 They saw him as they entered the Temple and might have even given alms from time to time. Not only did he rise up and walk, but he leaped and entered the temple with Peter and John, praising God. Praising God… in the temple… for what He had done to him. And all the people saw him, recognized him, and were filled with wonder and amazement. Notice that this man didn’t just go away, never to be heard from again, he remained and in-fact clung to Peter and John. Acts 3:12 And when Peter saw it he addressed the people: “Men of Israel, why do you wonder at this, or why do you stare at us, as though by our own power or piety we have made him walk? 13 The God of Abraham, the God of Isaac, and the God of Jacob, the God of our fathers, glorified his servant Jesus, whom you delivered over and denied in the presence of Pilate, when he had decided to release him.14 But you denied the Holy and Righteous One, and asked for a murderer to be granted to you, 15 and you killed the Author of life, whom God raised from the dead. To this we are witnesses. 16 And his name—by faith in his name—has made this man strong whom you see and know, and the faith that is through Jesus has given the man this perfect health in the presence of you all. Peter makes plain that it was neither by their power nor their piety that made this lame man walk; rather, it was faith in the Name of Jesus that the man was made perfect in their presence. Faith in the Name of Jesus, for the Glory of His Name. Peter then reminds those in the temple of Moses who told them the Lord would raise up a prophet like Moses, and that they should listen to Him. He then reminds them that all prophets proclaimed the days of the Messiah, the very days in which they lived, (the Law and the Prophets) and Peter declared the Gospel of Jesus Christ, that He whom they killed was the Christ, Son of the Living God. This was a whole-day affair. The Sadducees were greatly annoyed for 2 reasons. Firstly, they were greatly annoyed that Peter and John were teaching the people within the temple courts. How dare they! They are not scribes, teachers, lawyers, or priests! They have not been certified! Secondly, in their teaching of Jesus, they were proclaiming the resurrection from the dead. The Sadduccees did not believe in resurrection (Matt 22:23-33), one of the differences between them and the Pharisees. So they had Peter and John arrested and held over night since it was already evening. Now, don’t just breeze through this question. This isn’t merely an inquiry. What we have assembled here is a tribunal of sorts, those who were of the high-priestly family. It is of no little significance that Luke begins the next verse by specifying that God the Holy Spirit guided Peter’s response. This was a test that could very well lead to their death according to the Law of Moses in Deuteronomy 13. For that test didn’t rely on whether or not the sign or wonder had come true (clearly, the lame beggar was in-fact healed); rather, it hinged upon whether they pointed to the God of Abraham, Isaac, and Jacob. Let’s see Peter’s answer (prompted by the Holy Spirit). Wow. Straight to the Gospel, then the Psalms, then the Gospel. Declaring Jesus as the Christ, the only Name under heaven by which we must be saved. This is a huge statement. Let’s look at the Psalm to which verse 11 refers. So these members of the high-priestly family would not only have recognized the line quoted by Peter, they would undoubtedly have recalled the psalm and its prophetic implication. In such a short discourse Peter turned what was a test of a false prophet into a proclamation of Jesus as the Christ, the Son of David, the Messiah. Let’s continue reading in Acts 4. Acts 4:13 Now when they saw the boldness of Peter and John, and perceived that they were uneducated, common men, they were astonished. And they recognized that they had been with Jesus. 14 But seeing the man who was healed standing beside them, they had nothing to say in opposition. 15 But when they had commanded them to leave the council, they conferred with one another, 16 saying, “What shall we do with these men? For that a notable sign has been performed through them is evident to all the inhabitants of Jerusalem, and we cannot deny it. 17 But in order that it may spread no further among the people, let us warn them to speak no more to anyone in this name.” 18 So they called them and charged them not to speak or teach at all in the name of Jesus. 19 But Peter and John answered them, “Whether it is right in the sight of God to listen to you rather than to God, you must judge, 20 for we cannot but speak of what we have seen and heard.” 21 And when they had further threatened them, they let them go, finding no way to punish them, because of the people, for all were praising God for what had happened. 22 For the man on whom this sign of healing was performed was more than forty years old. The man was still there, standing with Peter and John before the council and all the people as a testimony to the Name of Jesus Christ, and His Gospel preached by Peter and John. Why could they not punish these men? Because the people were praising God for what had happened. No one could deny that a notable sing had been performed and it was evident to all the inhabitants. The focus of ministry is the Gospel of Jesus Christ, not the signs and wonders. A point we will continue to try to make here is that “signs and wonders” are meaningless on their own. Even according to the Law we know that what is taught is the measure by which we identify a false prophet, NOT whether or not the sign or wonder comes to pass! The teaching, the doctrine, the Scriptures far exceed the manifestations and signs and miracles. Our sense are easily manipulated and deceived. So many of these so-called faith healers preach false doctrines as a means of selfish gain. Many resort to parlor tricks and misdirection to ensnare the weak and immature. If salvation is a gift from God freely given, how then do we accept the false teaching that healing or blessings from God require “planting a financial seed” into the hands of the self-proclaimed anointed one? Paul talked about these, pejoratively calling them “super apostles” in 2 Corinthians 11. 11 I wish you would bear with me in a little foolishness. Do bear with me! 2 For I feel a divine jealousy for you, since I betrothed you to one husband, to present you as a pure virgin to Christ. 3 But I am afraid that as the serpent deceived Eve by his cunning, your thoughts will be led astray from a sincere and pure devotion to Christ. 4 For if someone comes and proclaims another Jesus than the one we proclaimed, or if you receive a different spirit from the one you received, or if you accept a different gospel from the one you accepted, you put up with it readily enough. 5 Indeed, I consider that I am not in the least inferior to these super-apostles. 6 Even if I am unskilled in speaking, I am not so in knowledge; indeed, in every way we have made this plain to you in all things. 7 Or did I commit a sin in humbling myself so that you might be exalted, because I preached God’s gospel to you free of charge? 8 I robbed other churches by accepting support from them in order to serve you. 9 And when I was with you and was in need, I did not burden anyone, for the brothers who came from Macedonia supplied my need. So I refrained and will refrain from burdening you in any way. 10 As the truth of Christ is in me, this boasting of mine will not be silenced in the regions of Achaia. 11 And why?Because I do not love you? God knows I do! 12 And what I am doing I will continue to do, in order to undermine the claim of those who would like to claim that in their boasted mission they work on the same terms as we do.13 For such men are false apostles, deceitful workmen, disguising themselves as apostles of Christ. 14 And no wonder, for even Satan disguises himself as an angel of light. 15 So it is no surprise if his servants, also, disguise themselves as servants of righteousness. Their end will correspond to their deeds. 2 Corinthians 11:19-20 (ESV) 19 For you gladly bear with fools, being wise yourselves! 20 For you bear it if someone makes slaves of you, or devours you, or takes advantage of you, or puts on airs, or strikes you in the face. Very strong words from the Apostle Paul. These false Apostles enslaved those who should have known better, for they had been taught the pure Word by Paul. Yet these so-called apostles came in and deceived the church, taught a different Jesus, imparted a different spirit, and took money from them, took advantage of them, put on airs, and even struck them in the face, and they endured the foolishness. Paul is enraged by the super-apostles and disappointed in the sheep who allowed themselves to be mislead. However, he loves them in Christ, enough to rebuke them and set them straight in his letter. To think that in this day we still bear with the likes of Todd Bentley, Benny Hinn, and T.B. Joshua. We have so much more available to us today than what Peter and John had to work with in Acts 3. They had only the Law and the Prophets and God the Holy Spirit by which they could teach the Gospel of Christ to the people. And they could not carry with them the Law and the Prophets, they relied completely on God the Holy Spirit to guide them. We have that same Spirit as a promised by Jesus, and we also have ready access to the Law and the Prophets, and the New Testament foundation laid by the Apostles. With so much given to us by God the Holy Spirit, there is no excuse to still be carried about by every wind of doctrine. In closing, let us look to how Paul closes out this letter to the Corinthians. 2 Corinthians 13:2-14 (ESV) 2 I warned those who sinned before and all the others, and I warn them now while absent, as I did when present on my second visit, that if I come again I will not spare them—3 since you seek proof that Christ is speaking in me. He is not weak in dealing with you, but is powerful among you. 4 For he was crucified in weakness, but lives by the power of God. For we also are weak in him, but in dealing with you we will live with him by the power of God. 5 Examine yourselves, to see whether you are in the faith. Test yourselves. Or do you not realize this about yourselves, that Jesus Christ is in you?—unless indeed you fail to meet the test! 6 I hope you will find out that we have not failed the test. 7 But we pray to God that you may not do wrong—not that we may appear to have met the test, but that you may do what is right, though we may seem to have failed. 8 For we cannot do anything against the truth, but only for the truth. 9 For we are glad when we are weak and you are strong. Your restoration is what we pray for. 10 For this reason I write these things while I am away from you, that when I come I may not have to be severe in my use of the authority that the Lord has given me for building up and not for tearing down. Amen. Remain in the Word of God, and continue preaching repentance and the Gospel of Jesus Christ for the forgiveness of sin and the promise of the Holy Spirit.